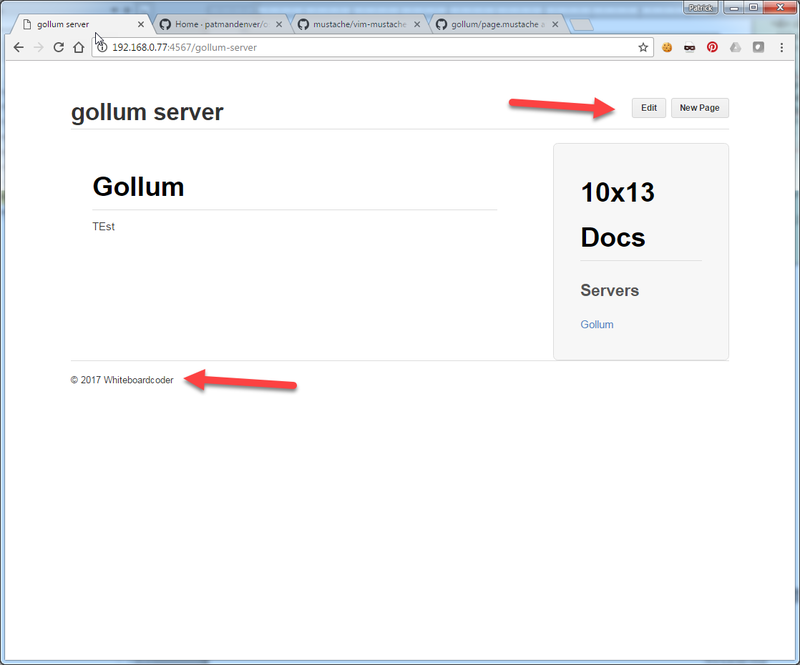 I am going to do a simple install and set up of Gollum on an Ubuntu 16.04 Server. 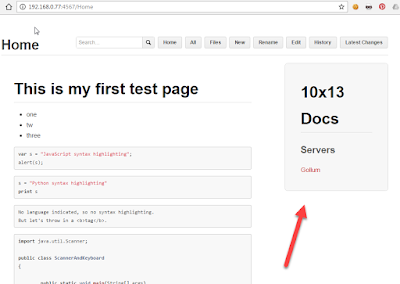 I have gotten used to using markdown and using the git wiki interface for making quick notes that I have decided it's time I figured out how to set up a Gollum wiki at home to use for my personal server documentation. 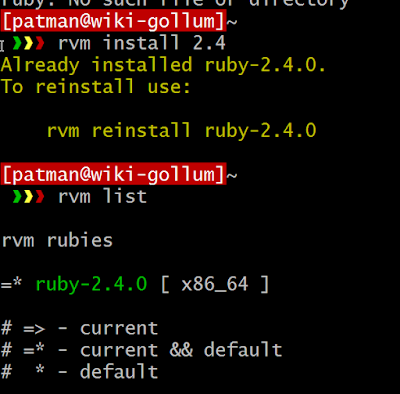 The github repo for Gollum can be found at https://github.com/gollum/gollum  according to the documentation here the easiest way to install gollum is via RubyGems. At some point it will ask for your user password. OK that was just me being stupid I should not have used git init --bare. Hey look I have something. 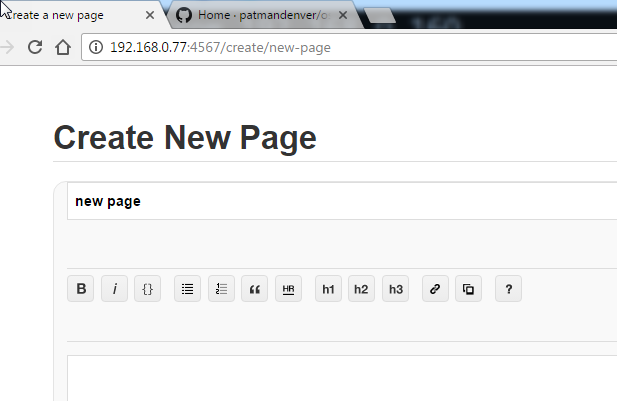 Let me try and create a few pages and see what I get. 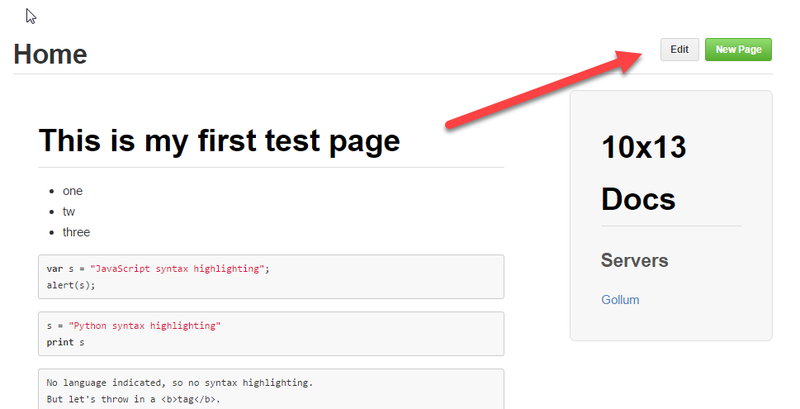 If I look at the log I can see that it was commited to the local git repo. I believe I just made the home page. Let me make another page. 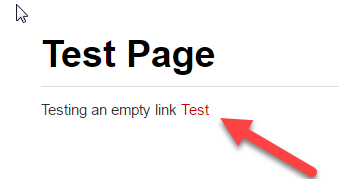 Looks like it made a red link to the non-existing page I referenced. If I click on it I do get a new page. OK so I got it basically working. 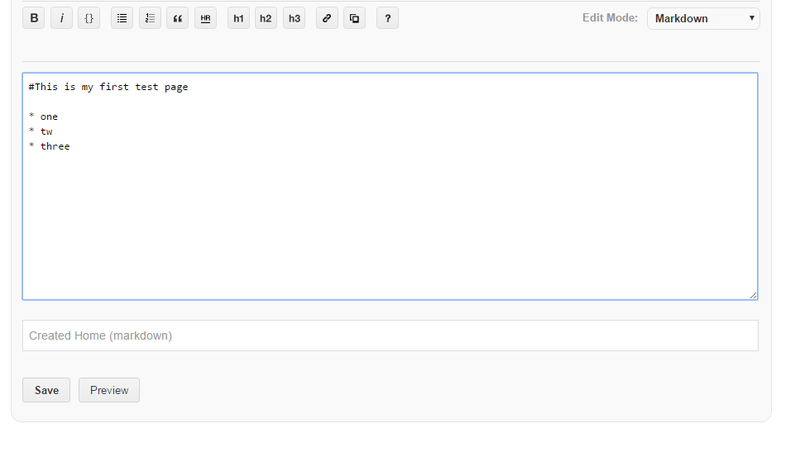 What I really want to do now is work on the interface. I would like to get it to look a lot more like a guthub wiki interface. Let me see how far I can get. I do not think that worked out so well _Sidebar.md turned into Sidebar-dot-md. I think I have to add this by hand. 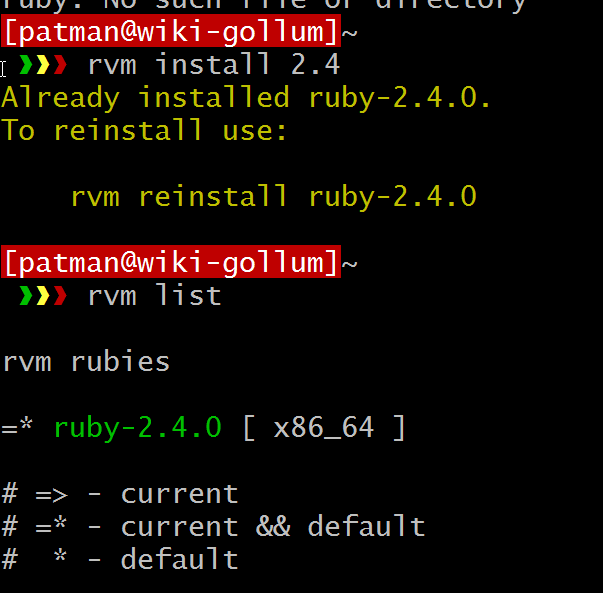 > git commit -m "Added sidebar"
> git config user.email "me@example.com"
> git confit user.name "Your name"
Start Gollum again and see what we get. OK that is a start. But how do I edit it now? 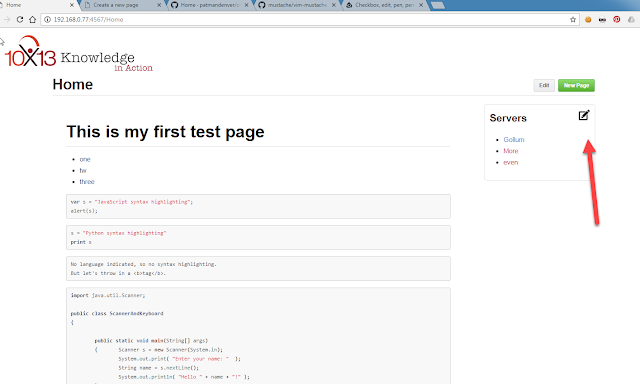 Let me first see if I can customize the header on each page. 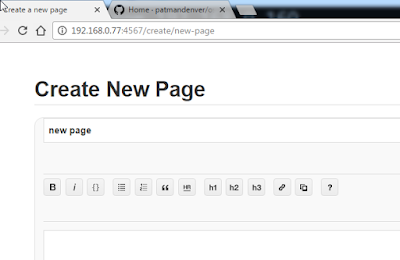 I can see it's much simpler just a page name and then an edit and New page button. I like and I am going to try and see if I can repeat it. I tried to add a _Header.md file which creates a result like this. Which adds a new header… not what I want in this case. 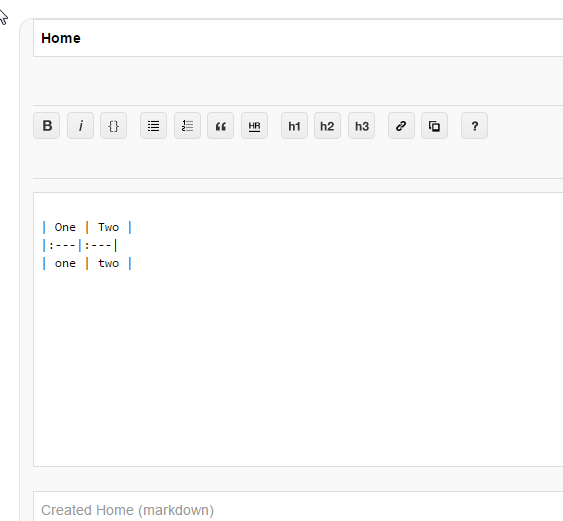 Now download the gollum repo and copy the templates folder to this folder. It should be the same since the template files are the same. Save the file and reload the page. And it has been altered! 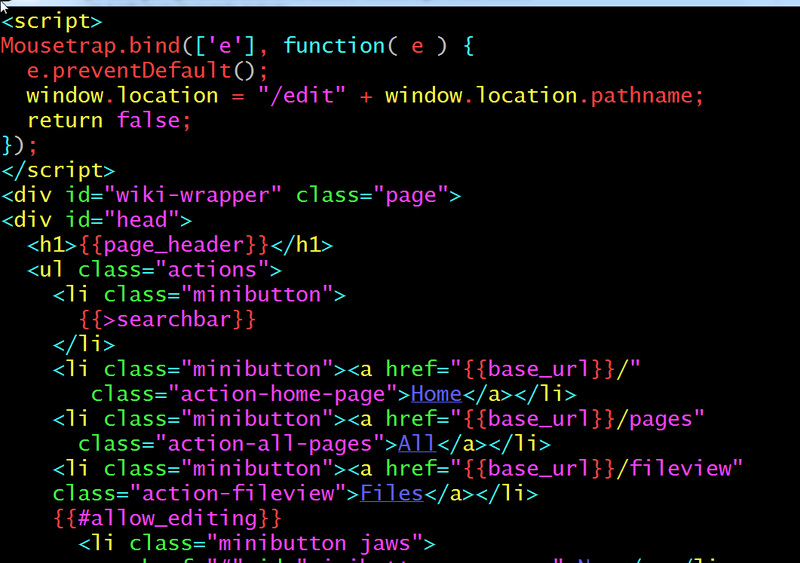 Before I go too far I want to fix the syntax highlighting in vim for mustache files. For now I will not fiddle with the last edited part (since I am going to be the only one editing these pages. The last thing I am going to do to this page is to get the New Page button to be green. 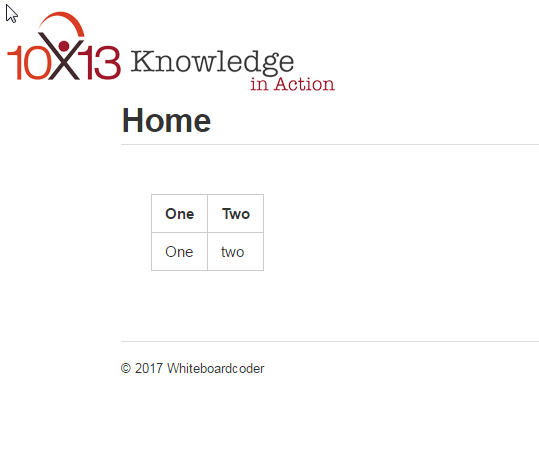 To do that I think I need some custom css. How do I get custom css in Gollum? 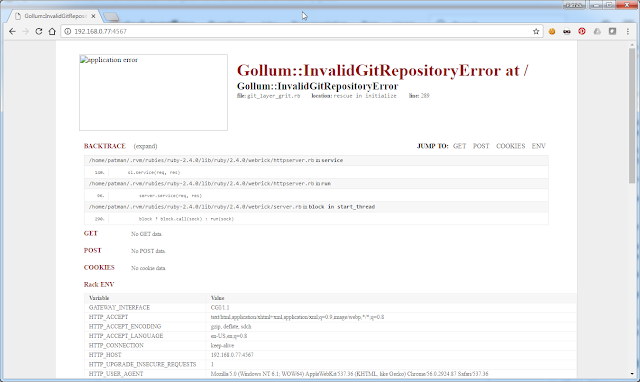 Stop gollum and create a custom.css file in the git repo. > git commit -m "Updated custom css"
Run gollum with this command. 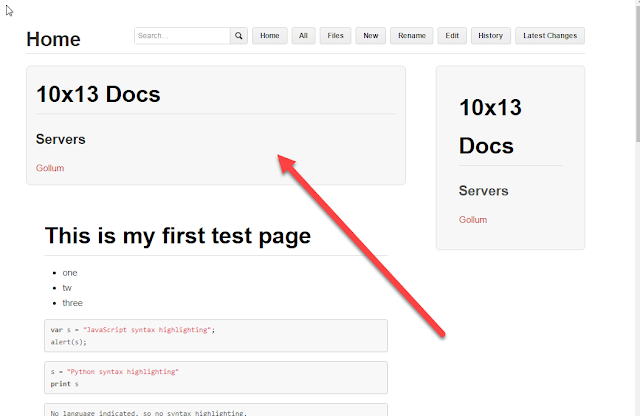 Now it does look like you do not need to add the custom.css to the repo to get it to work. 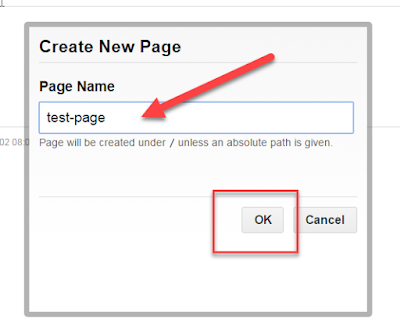 So you are free to tweak it and reload the page. 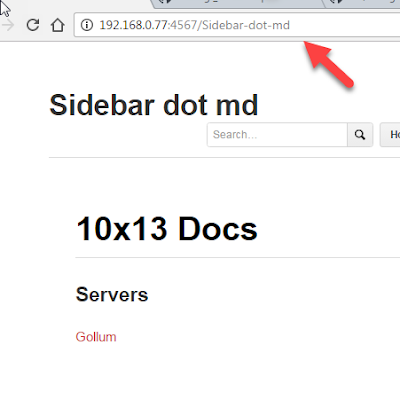 It looks like I can tweak the _Sidebar.md file if I go to http://192.168.0.77:4567/edit/_Sidebar directly. 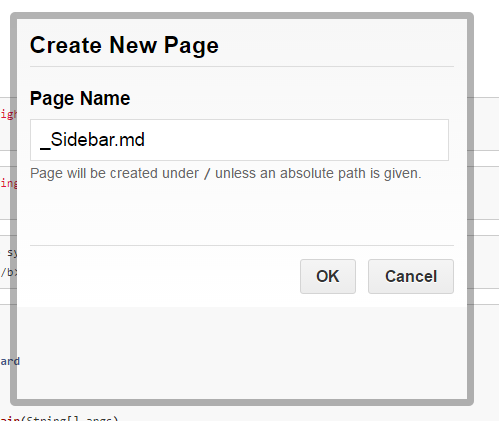 With that in mind I think I can tweak the page.mustache file and create a link to it within the sidebar. First I need an icon. 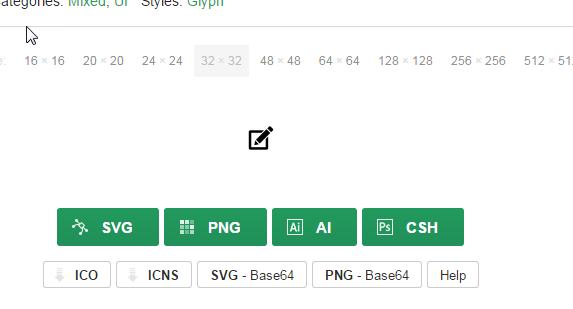 I use https://www.iconfinder.com/ a lot for getting free icons and on occasion buying one or two for a buck each. 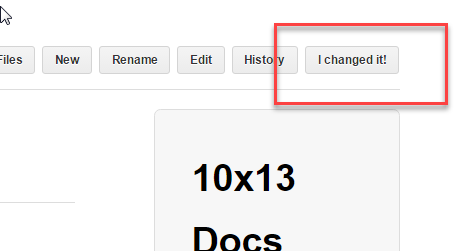 > git commit -m "Added pencil edit image"
Here is my file contents. I am not getting emojis like I want :smile: is not working. I wonder if I can update them? 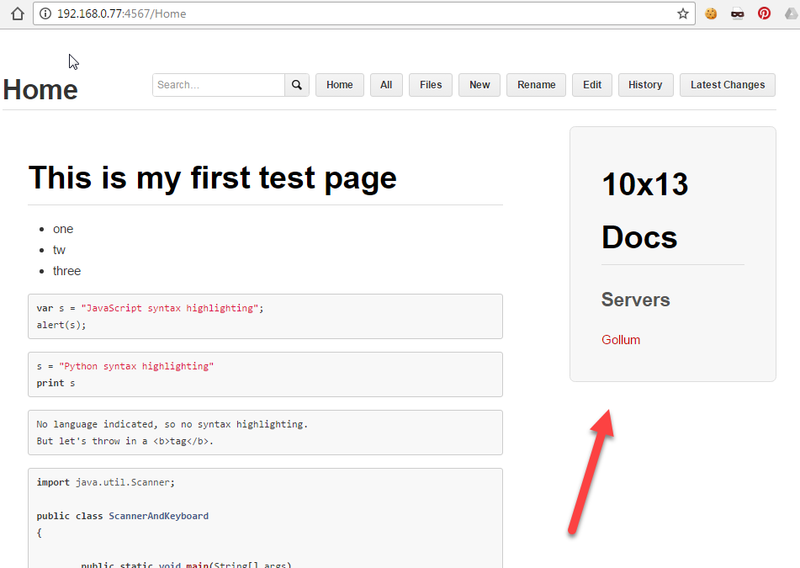 This is my first time installing gollum, does it have a problem with MarkDown Tables? By default, Gollum ships with the kramdown gem to render Markdown. However, you can use any Markdown renderer supported by github-markup. 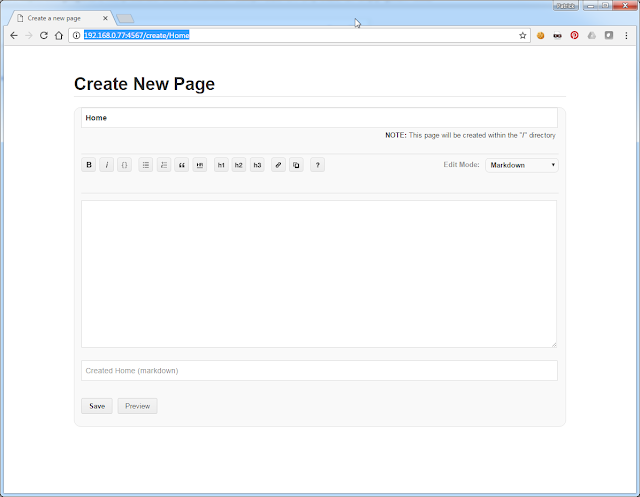 The thing to remember is that the first installed renderer from the list will be used. 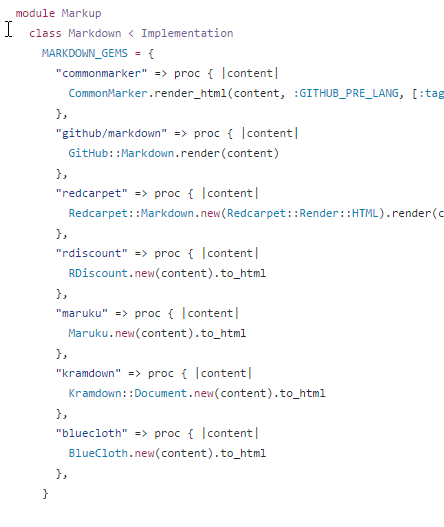 So, for example, redcarpet will NOT be used if github/markdown is installed. 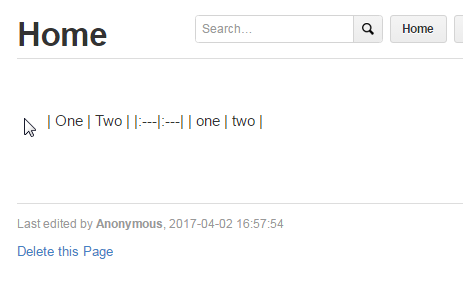 If I go over and look at https://github.com/github/markup/blob/master/lib/github/markup/markdown.rb I think this is the order they are talking about. Let me try and install the redcarpet gem and see if it changes anything. OK that did not help. In fact in this case some of the emojis that were working are no longer working. I am going to remove this gem. Ok I think that is enough gollum for now. · Set up nginx as a front with systemd starting gollum?